This is a branding challenge I created a solution for. I was asked to create from the bottom up a hot sauce. Each step of creating a theme, mission statement, story, label and bottle design choice. 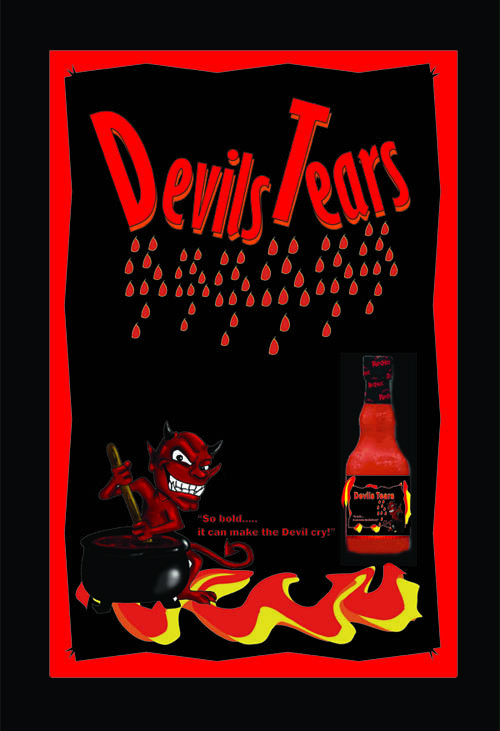 I liked the idea of devil’s tears being hot drops and I think this poster captures the feeling I was going for. Logo I created for http://www.slopdujour.wordpress.com my big brother fan blog! A good strong logo I created for a fan blog I do about Big Brother the TV Series. It’s a site created to the going’s on in the kitchen in the BB house and deals with the creative things the house guests create and what I can create for them (if only they could see it!) using the America’s choice vote food products. Fun! This is a persuasive poster I and another classmate worked on for my first class in Graphics Communication. The idea is not just to get the person to look at the poster, but to have it speak to them, and persuade them to take the action you desire. 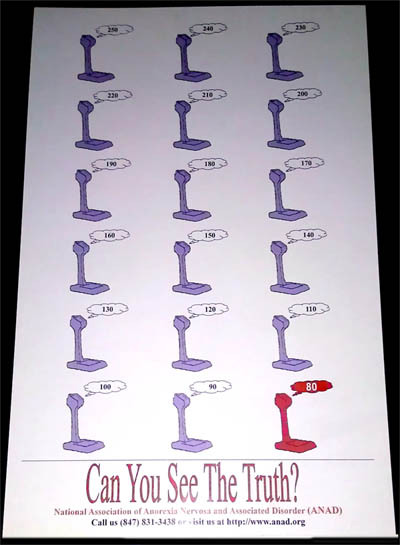 This poster uses repetition and a dominant color (red) to draw the eye straight down the page, and bring the reader to the contact information and the tag line “Can You See The Truth”. Effective in gaining the audience, and bringing them to the information. Been watching Big Brother 13 live feeds this season, and so far I’m not too impressed with the casting. All but a couple of the cast members are wannabe actors/actresses/famous persons, and it shows. This factor makes for some very unlikable characters in the house, however I think that might be a draw for viewership for CBS. I long for the days of Big Brother 1, back when Chicken George and Brittney and all the other house guests, had to earn money for food, and take care of the house. They actually had to negotiate and decide as a group what was necessary and what was decided was luxury and not important enough to spend precious budget on. They had to “live” with no contact with the outside world except for Big Brother himself. Learning to tolerate others habits, and behaviors, deciding who would be evicted each week by each individuals social behaviors. Undoubtedly the most fun for the viewers of the AOL free live feeds (back then it was free with a paid AOL account) were the banner planes that were carrying messages to the secluded house guests about the backstabbing and nasty actions of un-liked house guests. These messages were fan funded through donation and would be written to get as much information to favorites about the game. These were so much fun to write, watch and send! It made the viewer feel like they were part of the action. I think Big Brother needs to capture that feeling back somehow. The differences really make the show something special, not just a money-maker or fame production tank. Cassie missed out on Head of Household weekly photos because she took an hour and a half (really!?) putting on makeup. You missed the boat Cassie! I do think it takes a certain kind of ego to put yourself out there like the house guests on Big Brother do. But they want the Hollywood dream of the 2011’s. Get on a show, get famous, get publicity…..next stop……The Walk of Fame….. or is that shame? So readers, tune in Wednesday July 14th on CBS to watch the few real people on Big Brother 13. While it’s not as good as it used to be, it’s still my favorite program of the summer, and its bound to get more exciting and drama filled as each long day passes. GO TEAM JEFF AND JORDON!!! My favorite reality TV show started (well in broadcast form anyway) last night, and that show is of course the American version of Big Brother. Beginning its 13th season with only 8 out of 14 new players (6 players are from past seasons, so they are considered “all stars”) and sadly most of them seem as if they were “cast” and not just found. the backstabbing, lying, and drama. Its all part of the draw for most loyal Big Brother viewers, but I really like being able to observe and dissect the behaviors of the players and see how they present themselves. Sometimes I am shocked by how I will think someone is nice, then I find out I am so wrong. I was very lucky to have won a tweet contest for the live feeds this year, so I’ll be posting things about Big brother along the way. These are the 8 New house-guests who have been joined by three pairs of returning house guests. Let the games begin!!! Lets hear it for Big Brother 13!! !